A colour photograph of a stone church in the Miniature Village at Cullen Gardens. This miniature church is a replica of St. George's Anglican Church built in 1877 and located in Sibbald Point Provincial Park on Lake Simcoe. 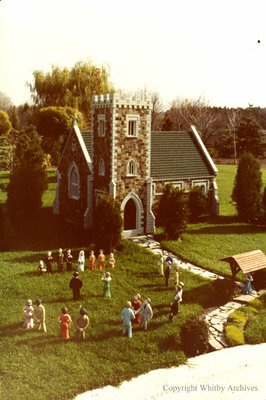 Stone Church in the Miniature Village, Date Unknown, Photographer Unknown. Whitby Archives A2013_042_165.